BEAST RDS MERCH / Tee-shirts, etc. 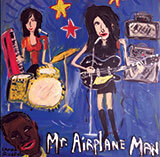 Hard to grab an original vinyl album of Mr Airplane Man out on Sympathy For The Records Industry back in the days, right? Beast Records are hopefully here to release this must have compilation including tunes from Mr Airplane Man first self-titled LP, “Moanin’” (SFTRI, 2002), “C’Mon DJ” (SFTRI, 2004) and so on. AVAILABLE IN JULY 2018! Pre-order your copy now!